"MONEY CARDS" are all the cards you buy goods and services with -- your credit cards and debit cards (which include not only your general debit cards, but also gift cards and other prepaid cards). What we offer are some special "EXTRAS" -- supportive products, tools, and information that we hope will help you manage your money cards and, especially, help you keep keep track of your credit card and debit card transactions. As expressed in some of the videos above, getting your credit card or debit card declined can occur for various reasons, some not your fault, but the most common reason is because you are not keeping track of your charges well enough to keep from bumping up against your credit limit or debit card balance! 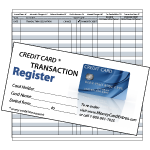 Money Card Extras has solutions for that through our assortment of manual registers that will help you stay "in the know" concerning your available credit or bank balance. And preventing your money cards from getting declined simply due to losing track is only one of several benefits you will gain by using our registers, as discussed further below. 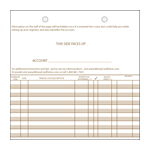 OUR FEATURED PRODUCTS ARE MANUAL TRANSACTION REGISTERS. To see our complete line of registers, just click HERE. 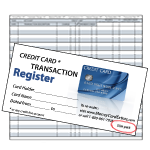 OUR FLAGSHIP PRODUCT IS A MANUAL TRANSACTION REGISTER FOR CREDIT CARDS! 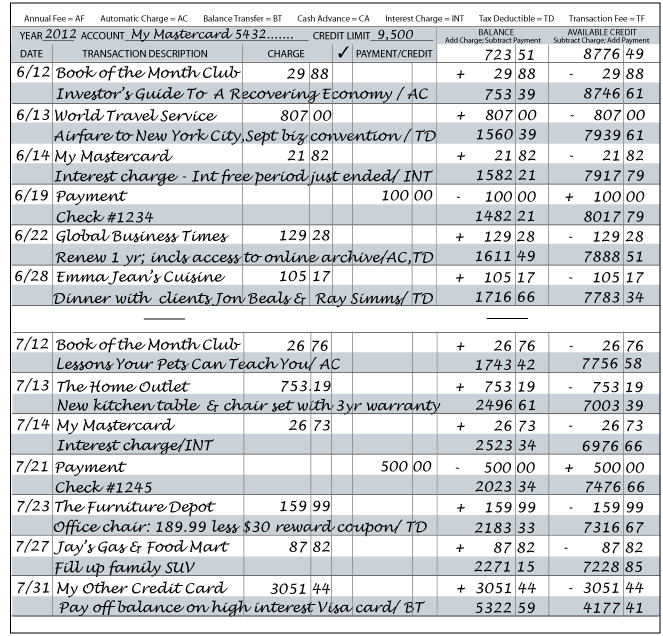 This is a great tool for tracking your credit card transactions. If you have been looking in vain for compact, portable, easy-to-use manual credit card registers it is because they have never been commercially available -- until now! We are happy to announce, your search is over! 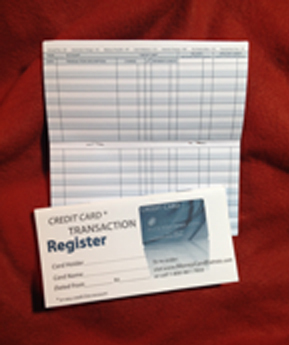 We have three variations of this credit card transaction register, depending on how many credit cards you'd like to track within a single checkbook cover: Standard size booklet, Slim size booklet, and Loose-leaf sheets. So, yes, finally... at last! -- manual transaction registers for credit cards are now available! 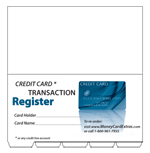 Click HERE to learn more about and purchase our standard credit card register! We also have registers for debit cards, checks and savings accounts. So, why use manual transaction registers in the high tech world we live in? Aren't there apps for that? Here are a few reasons. You'll always know your "true" balances. This is especially useful for those who often find themselves close to their credit limits and/or debit account balances. Keep your balances updated in our manual registers and you'll never need to worry about your money card being declined again! Obtaining your balances merely by contacting your banks, online or otherwise, will only provide your balances from their perspective, as they don't yet know which of your transactions have not yet arrived to the bank for clearance or settlement. This is largely due to checks you have issued, but this is also due to certain credit and debit card "holds" which can take some time to finalize. 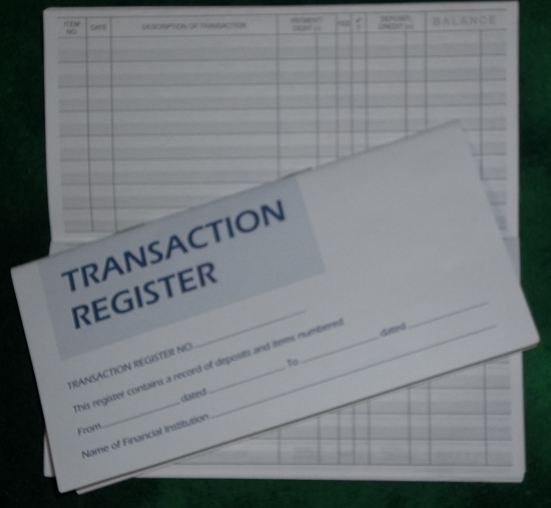 Even if you keep track of just the transactions (choosing not to keep the balances updated), manual registers provide a single place where you can more easily search for payments to particular vendors when needed, rather than fumbling your way through a bunch of invoices, receipts, bank statements, etc. Manual registers enable you to reconcile/balance bank and credit card statements, especially if you maintain the balances in your registers. Stop placing blind trust in your banks and money card providers -- they sometimes make errors. Stop assuming fraudulent activities won't affect your accounts. Having an independent set of records allows you to verify the accuracy and integrity of your accounts. Even if you prefer not to maintain the balances, then by simply entering your transactions in the registers you can at least verify the accuracy of the items charged to you as listed on your banking statements. 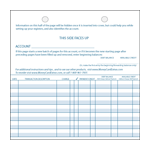 Manual registers provide an easy way to identify tax-related transactions. Memos entered into the registers while fresh in your mind,along with the basic transaction details, provide meaningful clarifications later on. If you have pre-authorized certain vendors to automatically charge your account monthly, semi-annually, annually, or any other period, referring to the automatic transaction schedule included with your manual register will keep you alert as to when those charges will hit your accounts and thus enable you to prepare beforehand and not get blindsided. If you are required, or choose, to manually enter your data to your software application, this can be most easily achieved when reading your transactions directly from a manual register, making shuffling paperwork, receipts, etc. during your computer sessions a thing of the past, as you likely would have already processed all that at the time of updating your manual registers. If you rely mostly on having your transactions imported to your online account or desktop/laptop app, by referring to your manual register you will easily detect duplications and easily edit transactions to the correct vendor names, transaction dates, memos, categories,etc. Online services like Mint.com often assign categories to your transactions that are wildly wrong, but easily corrected when the original information is before your eyes in your manual registers. Also, regarding checks, such imports don't "know" to whom a check was written, so you must edit and categorize checks anyway. All of this editing is far easier with a manual register in hand to refer to. 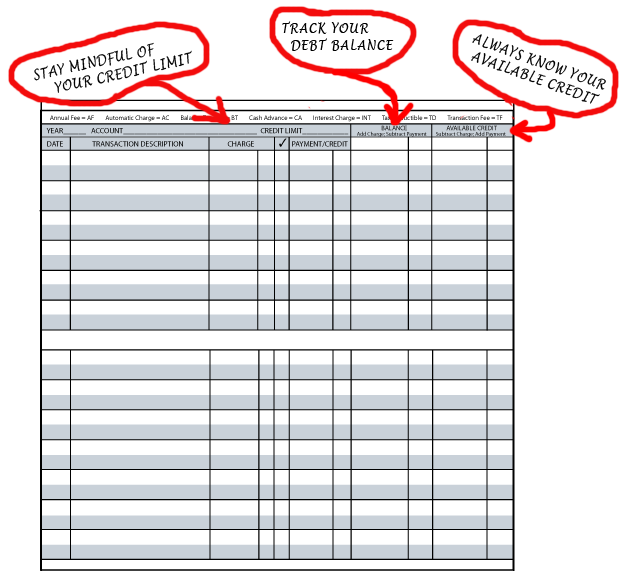 As stated above, if you keep your balances updated in your manual registers, you'll always know your "true" balances. This is especially useful for those who often find themselves close to their credit limits and/or debit account balances. Keep your balances updated in our manual registers and you'll never need to worry about your money card being declined again due to charges that would exceed your credit limit or debit card balance! Balances imported into an online service or computed in a desktop app based only on the imported data, and even balances reported on a bank's website, are rarely "true", as they can only reveal the balances from the bank's perspective, for the banks, and the online services that rely on them, don't yet know which of your transactions have not yet arrived to the bank for clearance or settlement. This is largely due to checks you have issued, but this is also due to certain credit and debit card "holds" which can take some time to finalize. And, quess what?, online services like Mint, Check (formerly Pageonce) and Hello Wallet may not have even the current bank's balances because they only pull in this information only once a day (and, with Mint.com, also when you log-in. But Mint does not appear to be consistent regarding the log-in update.) Fortunately, you can request an immediate update, but this request is not always honored (yet sometimes you are given the false impression on Mint's mobile app that your request was fulfilled). Not honoring every update request is understandable, considering these services have millions of users, and don't have the resources to process updates at the whim of all those millions, transaction by transaction. (But providing the false impression that they have done so is unacceptably misleading. Hopefully this is just a bug!) Still, not always having even the bank's current balance (itself rarely your "true" balance) adds another wrinkle as to why their balances are rarely your "true" balances. By using manual registers, you have access to your account balances and transaction history truly ANYTIME if you keep them nearby. This may be especially important for those who live close to their credit limits or debit account balances. Online services often can't provide the information you need anytime, due to temporary problems accessing your accounts (happens a lot), temporary site shutdowns for maintenance, smartphone updates that they haven't completed preparations for (it took Mint.com weeks to update its mobile app when iPhone upgraded to version iOS6, meanwhile their mobile app was inoperable), and so forth. Desktop computers sometimes crash due to hard drive failures, viruses etc. which will delay access to both your desktop app and to any online accounts. By using manual registers, you have access to your account balances and transaction history truly ANYWHERE if you keep them nearby. Again, this may be especially important for those who live close to their credit limits or debit account balances. Smartphones and other mobile devices can't always get the signal they need to connect you to your financial data just anywhere, but you can always carry your manual registers around with your usual stuff. You always have a "hard copy" of all your transactions in the event of a computer breakdown, or if your online service merges or goes out of business without providing you sufficient means of preserving your data. (Many Quicken Online users were ill-affected this way when Intuit bought out Mint.com and closed down Quicken Online). For a complete discussion of the above, and other, points, please refer to our article, "Why Use Manual Registers? ", available on this site. 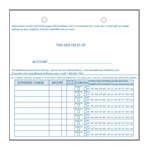 Click HERE now to look over and purchase our REGISTERS. Learn more about us HERE and about our product line HERE.